Notes: The station layout was unconventional with only one platform, on the up line. Down trains reached the platform via crossover points. As late as the 1950s Seghill station was at a focal point of mineral traffic. 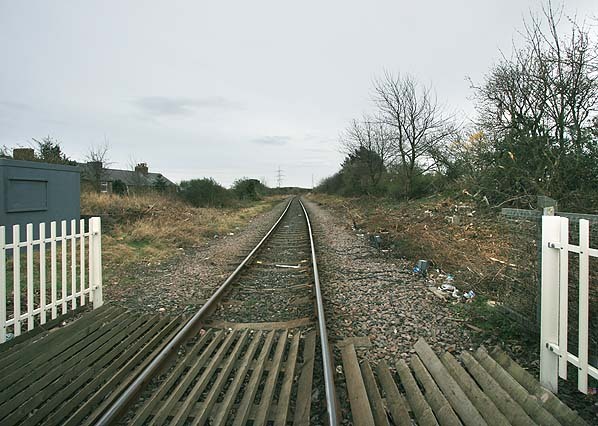 Immediately beyond the level crossing, just north of the station, the passenger line to Blyth curved sharply to the north-east, and three mineral lines forked from this route: one towards Cramlington (on the East Coast main line); a second to Seghill Colliery; and a third serving collieries at East Cramlington, Shankhouse and East Hartford. A short-lived 3-road engine shed was sited west of Seghill Colliery line north of Seghill station. It opened on 1 July 1840 and closed in 1855.
to the level crossing the platform ended without a ramp, abutting the signal box. Latterly this was a small wooden structure, replacing one demolished in the 1940s by a land-mine. 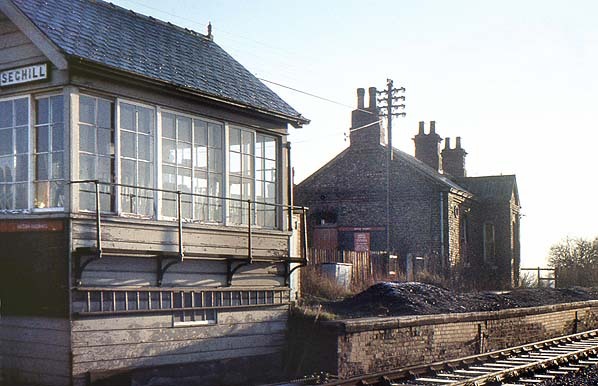 After closure in 1964 the building, platform and signal box remained intact in 1972. Ten years later these had all gone. In 1911 the station served a local population of 2,049 and the goods traffic was bricks, clay and ganister. 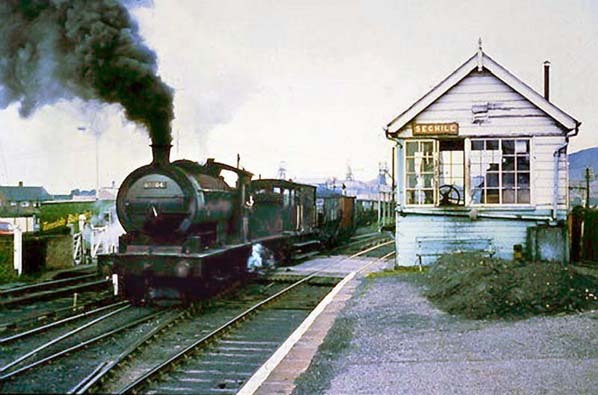 The station closed to goods traffic on 9 December 1963. Tickets from Michael Stewart except 0715 JC Dean, 1887 Bradshaw from Chris Totty, 1955 Bradshaw from Nick Catford. Route map drawn by Alan Young. Seghill had only a single platform, on the up (north-east) side, requiring down trains to switch tracks to serve it. 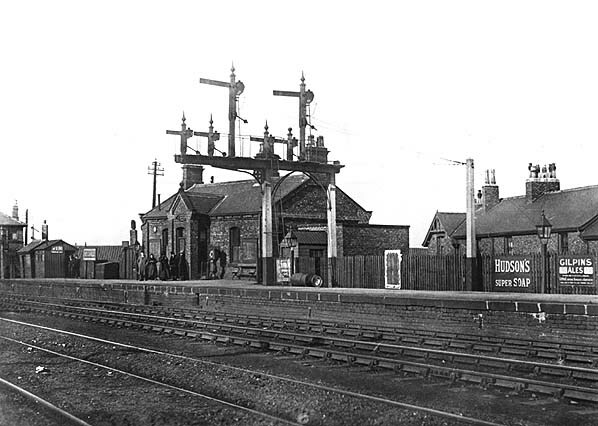 The platform seen here c.1910 has a single-storey building offering booking and waiting facilities, and the two-storey station cottages can be seen to the right. 1865 1:2500 OS Map. The 'main line' leaves the map in a northerly direction and a colliery line to East Cramlington diverges from it to the north-north west. Seghill Colliery is served by the branch heading north-westwards, whilst the Dudley Branch of the Cramlington Waggonway strikes off to the west. 1919 1:2500 OS Map. The single platform and its building can be seen to the east of the 'main line'; there was never a 'down' platform here. 1961 1:2500 OS Map. Three years before the station closed urban development to the north-east can be seen. The station cottages are identified on this map. 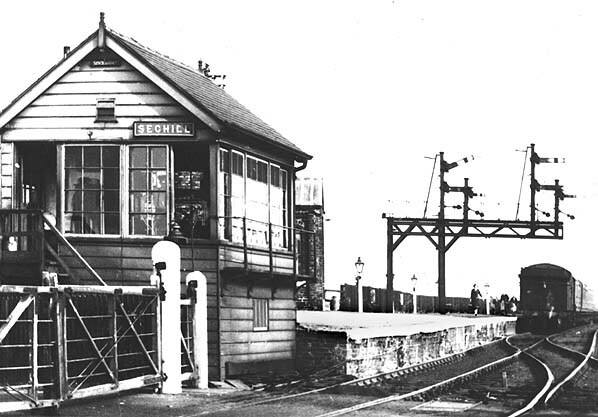 Looking south-east at Seghill signal box and station from the level crossing, probably in the early 1950s. 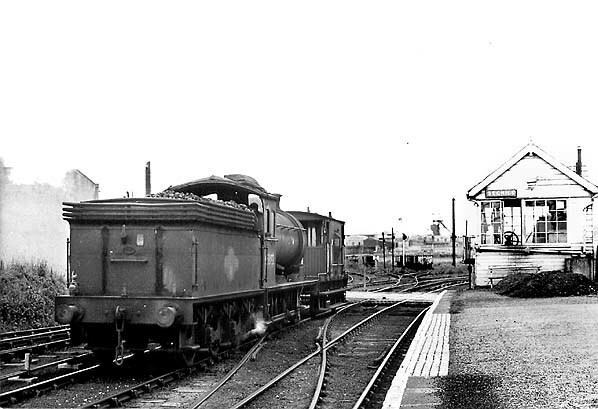 In 1961 a southbound coal train is passing Seghill signal box and entering the station. This view is taken from the single platform. Seghill Colliery and its pit heap are in the background; the colliery closed the following year. The train is running ‘wrong-line’, presumably having emerged from one of the mineral lines on the down side of the B&T Backworth to Hartley route – possibly from Seghill Colliery - and it is about to cross over to the up track at the points in the foreground. 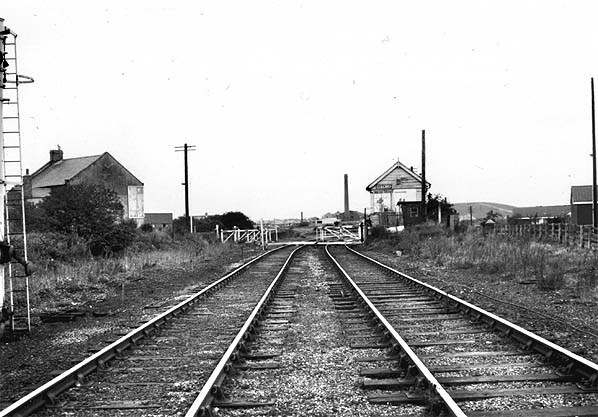 In 1962, or earlier, the signal box is seen looking north-west along the single platform. Just beyond the level crossing the passenger line swings sharply to the right, whilst straight ahead the lines serve Seghill Colliery (closed in 1962). 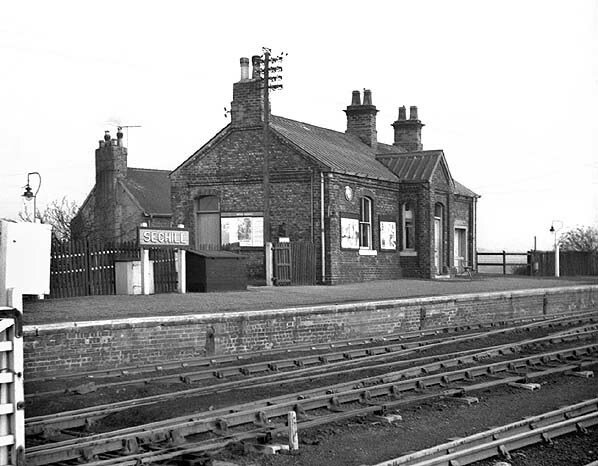 Seghill station, looking east in November 1964; the station closed to passengers at the beginning of that month. The single platform is seen with its modest building providing booking and waiting facilities. The nameboard is LNER vintage. The gas lighting has been updated by BR(NE) with ‘Sugg’ lamps replacing casements. The signal box, station building and single platform at Seghill looking south-east from the level crossing in December 1972. The site of Seghill station, looking north-west in September 1978. The single platform was formerly to the right, and the signal box is still in place. Some of the buildings of the disused Seghill Colliery can be seen ahead, including an associated brickworks (with chimney). The pit heap, seen to the right of the signal box, has largely been removed. Looking north-east at the site of Seghill station in March 2009. The line has been singled, level crossing gates have been removed and the signal box has been replaced with a cabin. There is no evidence that there was ever a station here.